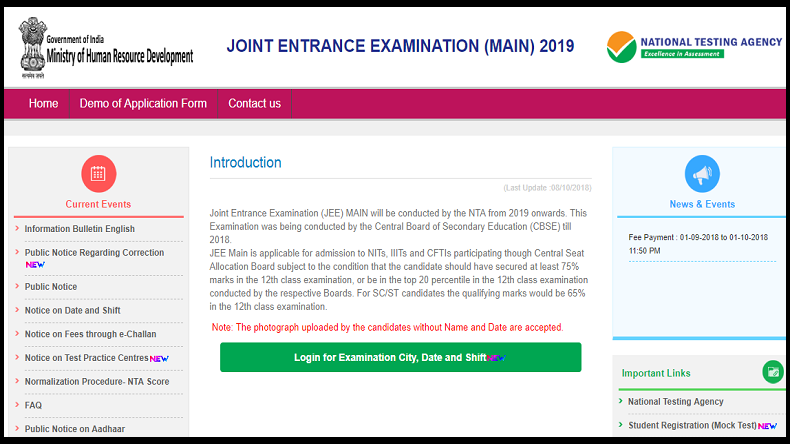 JEE Mains 2019: The application process for JEE Main April 2019 has been started on the official website jeemain.nic.in by the National Testing Agency (NTA). The interested candidates are requested to apply for the same through the official website. JEE Mains 2019: The National Testing Agency (NTA) started the application process for JEE Main April 2019 on February 8, 2019 on the official website jeemain.nic.in. The interested candidates are requested to apply for the post on the official website. As per reports, the candidates who have already appeared for the JEE Main January 2019 exam are also eligible to apply for the JEE Main II exam. This examination will be held in April 2019. However, if a candidate has appeared in both the JEE Main exams, the better of the two will be considered to determine their eligibility for the next level. Step 1: Click on the application link given on the JEE Main website. Step 2: Login with your JEE Main January 2019 with application number along with password and date of birth. Step 3: Fill the application form by filling choice of course(s) (Paper 1 or Paper 2 or both), question paper medium, and choice of four centre cities. Step 4: The candidates are to be paid either by debit card/ credit card/ net banking/ e-challan. Step 5: A confirmation page will be appeared. Download and save the confirmation page. The JEE (Main)-2019 is being conducted twice before admissions in the next academic session. For the first attempt of the examination, they can get an experience of knowing their mistakes. It will reduce chances of dropping a year and droppers would not have to waste a full year. If anyone missed the reasons, then he/she won’t have to wait for one full year.